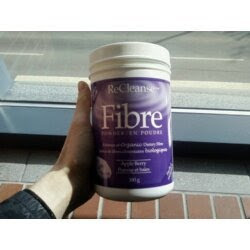 Since I ran out of my beloved Fibersmart and 4Fiber today and didn't have enough $ to buy new ones, I decided to grab the last marked down tub of Prairie Natural's Recleanse Apple Berry Fiber powder. I have used their chews before- and they are EXCELLENT in terms of taste- but never the powder. 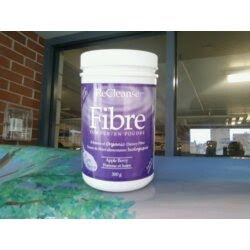 I was looking for something that I could eat 'pudding style' like the 4Fiber /Fibersmart . I measured out 24g and mixed it with some Sugar Free Vanilla syrup. The texture is grainier- not flaxy/nutty/grainy/ground like the other ones. Kind of like baking soda. It tastes great, but didn't thicken as I had hoped. This would be BEYOND amazing in Greek Yogurt, Cottage Cheese, smoothies, ice cream, cream cheese (as a dip). Seriously- it actually got a bit frothy and you could see the berry/banana in it. It didn't taste artificial AT ALL! It has NO sugar (Stevia and Xylitol ) and is all natural with zero fillers and psyllium. The labels are extremely confusing and listed no nutritional information. 2 years ago I inquired about this and the company was kind enough to send me lab reports.